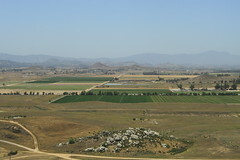 On the Public Record presents: The California Resilient Agriculture initiative: OtPR writes, “My guess is that it would take two more dry years for California to get serious about revising the water rights system. (Especially with the possibility of getting a water rights reform initiative on the presidential ballot in November 2016.) I think people get serious about drought in year six. In year four, apparently, we tentatively bring up the topic. … So far I’ve only seen mentions of the concept. I haven’t seen anyone but me put forth an actual proposal. People say vague [stuff] like “you know, what Australia did.” But here I am with this blog and no sense. My recent insight was that water rights reform should be part of a package so big that water rights reform is the least of the boldness. I call this package “California’s Resilient Agriculture” initiative. ... ” Read more from On the Public Record here: Go big or go home. See also: Let us never refer to this post. Think what On the Public Record could do with ‘direction’ and ‘creativity’: OtPR writes, “I’ve been seeing the word ‘flexible’ come up from agricultural advocates. … Flexibility is code for “not enforcing the Endangered Species Act” or disregarding environmental requirements when building new storage. Somehow, from agriculture advocates, flexibility only ever applies to the environment. In practice, California agriculture has been moving away from flexibility as they change from annual crops to permanent crops. ... ” Read more from On the Public Record here: Think what I could do with “direction” and “creativity”!